Posted: Thu Apr 07, 2016 9:52 am Post subject: I've stopped dreaming about my next 911. 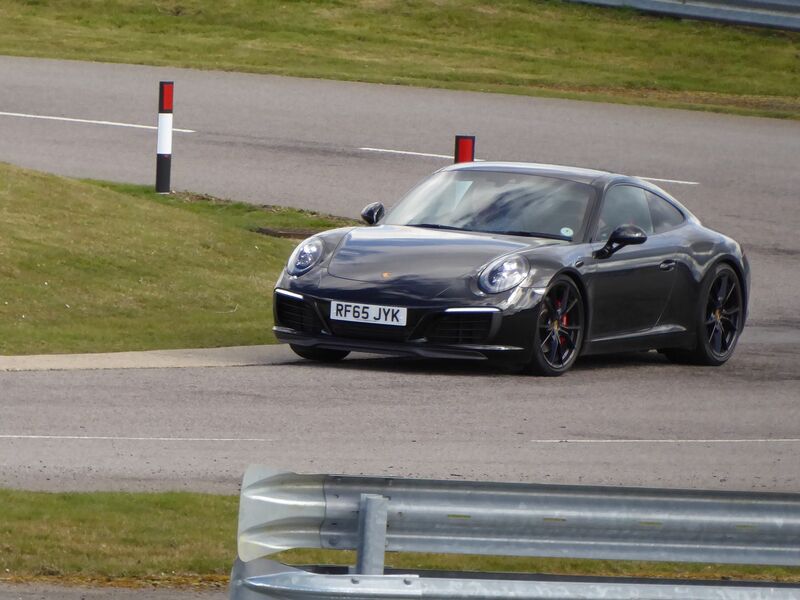 I had an excellent day at the Silverstone Porsche Experience Centre last week driving a 991.2S. In addition to getting some invaluable driver training nearly 2 hours in the driving seat gave me a great chance to thoroughly assess what I had thought would be my next 911 and the 150 mile drive each way in my current car proved to be a useful back-to-back comparison session. I chose to forego the 0-60 and back to 0 opportunity that many experienced and spent extra time on the superb handling circuit, kick-plate and ice-hill. The opportunity to find how what happens to a 911 on black ice - with and without the different levels of PSM - was incredible and this bit, more than any other, I'd seriously recommend to anyone planning to drive their car all year round. The 991S performed fantastically on the handling circuit and was a real joy to drive but it came across as a whole different car to any 996 or 997 I'd driven before but the traction and push from the rear made it clear that this is still undeniably a true 911 and a proper sports car. On the short test track where maximum speeds attainable are only c80 mph the car itself didn't feel any different to the 991.1S I'd driven previously. The power delivery was so linear that I certainly wouldn't have realised I was driving a Turbo and the interior was so similar to every 981/991 I'd driven before that I could have been driving any of them. As a car to drive regularly I'm convinced that any 981/991 would be superb and I doubt that the move to smaller capacity turbo-charged engines will put off buyers of new cars. I'm equally certain however that it'll be the last normally aspirated cars that will become the most sought after by enthusiasts. Jumping back into my own car the mid-noughties style of the interior was significant. I've always thought of the pre-996 dash layouts as being ancient and that the 996/997 gave a nice blend of classic v modern. In reality, compared to a 991 they all just look 'old'. That's not a criticism but it is a fact. 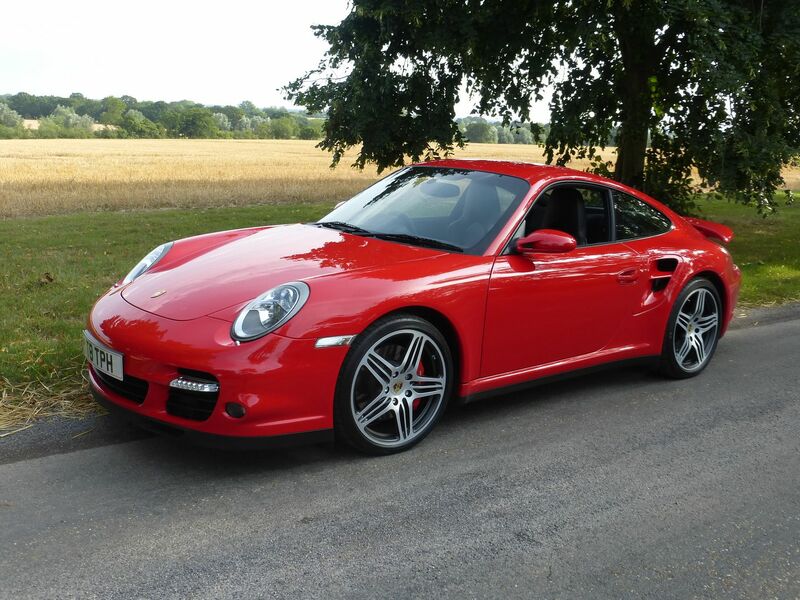 Many will prefer the pre-2012 look, and it probably suits the character of those cars, but it would definitely put me off buying a late 997 over an early 991 if prices were similar. At the moment however all 981/991 cars are still significantly more expensive to buy than their equivalent predecessors and that is enough to reinforce my intention to 'stick' for at least another 12 months. With any luck a combination of holding values of the 997T and depreciation of an early 991C4S will mean that the 'cost to change' will get less. More importantly, as a car to drive occasionally - as I do - the 997T remains special. The frustration of not being able to 'stretch her legs' very often is probably no different to what I would experience in any other 911 and the 21 mpg average when only doing 6k miles a year is palatable. My drive home from Silverstone underlined my thoughts that, whilst a Turbo can be driven like a Carrera, when conditions allow a Carrera can't perform like a Turbo. I've always been one to think of my next car, often soon after I've just bought a current one, but sometimes there comes a time when those thoughts can be comfortably put on hold for a while. Very interesting read and thanks for posting. Its good you've done this - and lets you know where you stand. I too feel comfortable in my 997 Gen 2 PDK (3.6) - though the GTS does lurk in the background for me. I think its great that porsche can have these experiences - I think I'll book myself in too. Posted: Thu Apr 07, 2016 11:13 am Post subject: Re: I've stopped dreaming about my next 911. Posted: Thu Apr 07, 2016 1:24 pm Post subject: Re: I've stopped dreaming about my next 911. Excellent thread - I too window shop from time to time but I am sticking to my old 997.1 for a few years. I couldn't justify the £ jump to my dream of a GTS manual. Posted: Thu Apr 07, 2016 11:20 pm Post subject: Re: I've stopped dreaming about my next 911. My drive home from Silverstone underlined my thoughts that, whilst a Turbo can be driven like a Carrera, when conditions allow a Carrera can't perform like a Turbo. I have no desire to buy another 911. This one will keep me busy/happy for years to come I think. Interesting indeed! I have given some thought to what my next car might be, I had originally thought my car would be a brief toe in the water, get the 911 thing done experience, but I am now sort of hooked! Will probably never be able to afford a current model, and my dream GT3 will have to wait until I win the lottery! I test drove an F-Type a few weeks ago and I must admit I was very impressed, but as a drivers car..no, I got back in my humble C2S and whillt the F-Type made it look a little dated, it didn't give me the smile I get every time the engine howls past 4500 rpm or the feeling of being connected to the Tarmac! Posted: Wed Sep 20, 2017 10:56 am Post subject: Re: I've stopped dreaming about my next 911. Well April 2017 came and sure enough I started looking seriously again. In the 12 months that had passed the value of my car hadn't changed but sadly asking prices for 991s hadn't fallen as much as I'd hoped and the C4S particularly seemed to have kept very buoyant - helped considerably by values of the 997.2C4S rising in that same period. I came very close to pursuing a beautiful Aqua Blue car with exactly the spec' I'd choose at an OPC for £64k but the 57k miles in 4 years put me off. Some days I still kick myself for not doing so but in all honesty, knowing that car would have been showing over 80k in 3 years time, it was probably the right decision. I've spent the last 5 months monitoring the situation closely and still really like the 991 but after a great summer in my trusty red car the concept of spending an additional £20k just doesn't make sense for me. By next April I've no doubt I'll have thought and re-thought it several times and might even be considering a 2/2S but, for now, I'm still sticking. Posted: Wed Sep 20, 2017 2:54 pm Post subject: Re: I've stopped dreaming about my next 911. Ive been looking at 991's for a while too, the 4S are right up there, close to the 991GTS, which arent moving either. Id really love a 991 GTS, just cant see them dropping much at all. At the moment im back on 997's for now, including a nice C4S in white which has risen 5k in price in 16 months (as i nearly bought it then). I darent sit in a 991, for the reasons you quote, and im not 100% sure a 991 will fit in the garage, a 997 WB will be tight. Interesting to read your thoughts on it Terry. Whilst the 911 will always have a new customer base, if a lot of these buyers opened their minds they would see that there are cars 1/20th the price which are just as good (if not better) within the marque. Posted: Wed Sep 20, 2017 9:22 pm Post subject: Re: I've stopped dreaming about my next 911. I came very close to pursuing a beautiful Aqua Blue car with exactly the spec' I'd choose at an OPC for £64k but the 57k miles in 4 years put me off. That came up on my radar too, but no PSE IIRC? Mileage was too high for me as well, spending an extra ~£30k for a higher mileage car than my current one didn't really make sense. Out of interest why do you have to have 4WD? Posted: Wed Sep 20, 2017 11:37 pm Post subject: Re: I've stopped dreaming about my next 911. It might be psychological but after 8 years owning them I find the extra security of 4wd 911s comforting on damp/wet roads. As far as the 991 goes the rear red reflector is a big + too. Posted: Thu Sep 21, 2017 9:12 am Post subject: Re: I've stopped dreaming about my next 911. Posted: Thu Sep 21, 2017 9:18 am Post subject: Re: I've stopped dreaming about my next 911. I'd be losing 4 mph if I went for a 2S so another 3 or 4 won't make much difference. I'm pretty sure 185 will be enough for most of my needs. The contrast between 991 and 996/7 is subtle in dynamics, but significant in terms of size and the aesthetics of the interior. As any 'everyday', do it all car, a 991 of any guise would be lovely and, no doubt, the bells, whistles, trinkets and baubles of the much newer dash would likely also offer useful functionality, but... they look very, very 'busy' compared to the no nonsense 996 dash. I am totally convinced that my future is with either the 996 turbo, or a GT3. Whilst the 991 GT3 is very, very good, I think my heart would always want a Mezger powered example. The dilemma is; can I justify spending more than twice what the turbo is worth to trade up? Really interesting feedback on the 991.2S.